Every Quote is Personalized With Delivery and Installation Included. 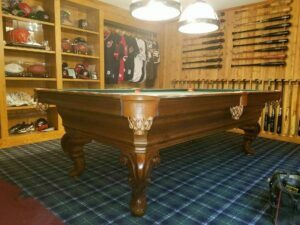 Gorgeous, sturdy, and absolutely massive in stature, this 10’ Brunswick-Balke-Collender Regina snooker table is a classic antique billiard table that is sure to impress! 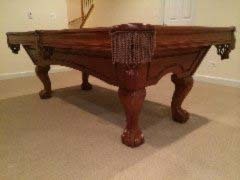 Sister to it’s carom table counterpart, this “Jumbo” framework snooker table is furnished in quarter-sawed oak and finished in a handsome medium golden color that is hand rubbed to a dull polish, making it easier to clean than other types of finishes. 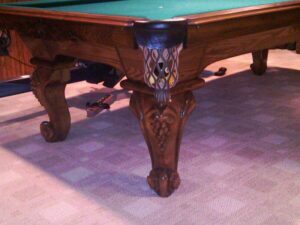 Despite it’s tremendous size, the Brunswick Regina snooker table can be fully disassembled and taken apart for transportation purposes. The legs as well as the body framework are built up in compound construction, meaning that various types of woods are used and tongued and grooved together for the ultimate stability. The four legs are each 10.5″ square at the base, and taper to 9.5″ at the top. They are also doweled and reinforced by corner blocks and solidly built into the framework of the body. As with all Brunswick tables, you can be certain that the engineering and manufacturing is of the highest quality, with all mitres, corners, and edges being precise and true. The slate bed is made up of 3 pieces (each 1″ thick) of top quality Vermont slate, which are secured together evenly with absolutely no screw holes visible on the playing surface. 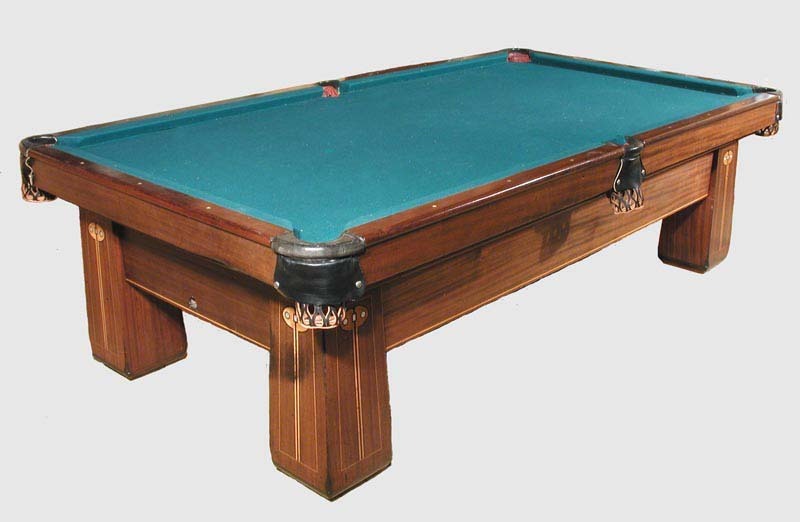 The Regina’s cushion rails are constructed with several different types of hardwood to give the snooker table stability and strength, but also to protect it from climatic changes. Additionally, this table features invisible cushion bolts which are covered by what is known in the industry as ‘blind cushion rails’. Fitted with Monarch Perfect Angle cushions and topped with solid rosewood corners, No. 6 style countersunk pocket irons, and decorated with pearl sights and the famous Brunswick metal name plate, the Regina is more than just a snooker table – it’s a work of art! 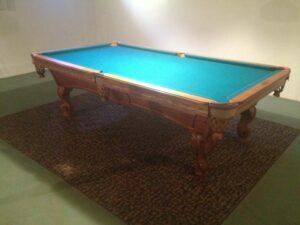 If snooker is your game, look no further than the Brunswick Regina snooker table! Its superior strength and fantastic durability mean that this table will last for many years to come. For more information on this, or any of our other snooker tables, give us a call today! Call Today To Schedule A Time!